This tutorial guides you through the process of getting Cytoscape Web up and running within a HTML page. Once you have Cytoscape Web working, you can continue on in the tutorial to see how to interact with Cytoscape Web. Additionally, visual styles are presented as a more complex example of how to interact with Cytoscape Web. All the files you need are in the latest version of the Cytoscape Web distribution archive. Get the latest version of the archive, and extract the files. When opening the examples as a local files in your browser, you may not be able to see Cytoscape Web. This is due to Flash security settings. 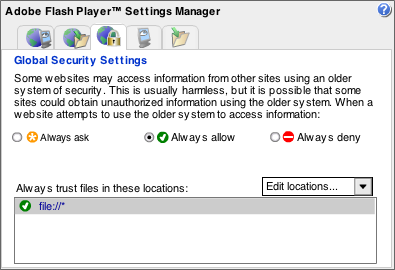 Make sure to allow Flash to run from the local filesystem (file://*) in the security settings panel. You do not need to change the security settings if you deploy Cytoscape Web on a web server, such as Apache. The best way to familiarise yourself with setting up Cytoscape Web is to go through an example. Now, take a look at this example. It has everything needed to get Cytoscape Web up and running. The code above is embedded below. If you are following along, you can copy and paste the code above and adjust the script tag references to the path where you extracted Cytoscape Web. When loaded in your browser, the file you would have made would look just like the embedded code below. The main thing to keep in mind is that you can not interact with most of Cytoscape Web until the graph is drawn. Thus, you can interact with Cytoscape Web by using the ready callback function, which is called when Cytoscape Web is finished drawing the graph. This example interacts with Cytoscape Web by getting attributes values that were set for the nodes and edges in the graph. This is achieved by registering with the addListener function for click events. // you need to specify a data schema for custom attributes! Now that you know how to initialise and interact with Cytoscape Web, you can look to the API reference to customise Cytoscape Web exactly to your liking. Have fun! If you would like a bit more in the way of instruction, see the next section on how to set the visual style. The example there is a bit more complex, but it should give you the opportunity to become more familiar with the Cytoscape Web API. Visual styles configure the way that the graph is visually displayed. You can create a visual style statically or programattically, by setting the visual style at initialisation or by using the visualStyle function. This example changes the visual style of the graph from the previous examples. The style is set at initialisation. Additionally, clicking the link changes the visual style programattically by changing the background color to a randomly selected color for each click. This example has used only a few visual properties for the sake of simplicity. However, there are many visual properties that exist in Cytoscape Web that can be used to control exactly how things are visually displayed. Take a look at the visualStyle function for more information. XGMML: This XML format supports subgraphs by allowing <graph> tags to be nested into a node's <att> tag. GraphML: also supports nested graphs. NetworkModel: Cytoscape Web's native format is a simple option. You just need to set the parent node ID in the nodes' data, like in the example bellow. At any moment, you can create compound nodes by adding new nodes to another node. You can also play with the compound nodes demo. This tutorial should allow you to have Cytoscape Web up and running and interacting with other components in your page. You should now be sufficiently capable of using the API reference to customise Cytoscape Web to your specific needs. If you still have questions, take a look at the FAQ. Most likely, your question has already been answered there.